Chris Steele, a library staff member and Regis University graduate student working on his MA in liberal arts, created a collection of filmed interviews with Noam and Aviva Chomsky. Noam Chomsky is Institute Professor in the Department of Linguistics and Philosophy at the Massachusetts Institute of Technology. His daughter Aviva is Professor of History and Coordinator of Latin American, Latino and Caribbean Studies at Salem State University. 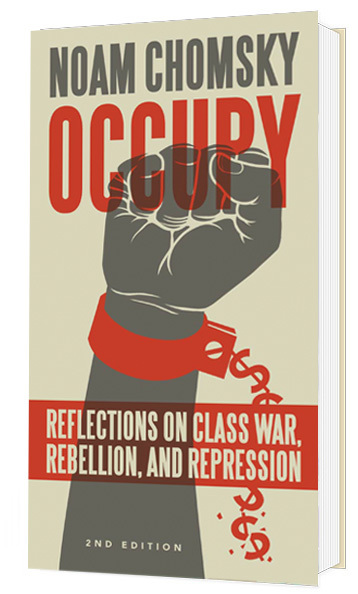 These interviews are referenced in Chomsky’s new book, Occupy: Reflections on Class War, Rebellion, and Repression, 2nd ed., which will be published on November 5, 2013. Watch the interviews online at Regis University Digital Repository’s Chomsky Family Collection. The Colorado Alliance of Research Libraries is highlighting how some of their Alliance Digital Repository member institutions are using their repository platform to support open access to research. Find out more about the Regis University Digital Repository (RUDR) and how other member institutions are using their digital repository sites to provide access to traditional results of research such as journal articles, reports, theses, and dissertations, as well as to digital audio and video files created during original research. EBSCO has resolved the issue with displaying PDFs on EBSCOhost. Documents should load and open just fine now. There is an issue right now with PDFs loading and opening in the EBSCOhost databases. EBSCO is aware of and working on the issue. The issue is somewhat intermittent. You may be able to connect if you try a different browser. You may see a pop-up box prompting for a login to connect to content.ebscohost.com, an error message, or a file start to load then hang up and not open. We will post an update here when the issue has been resolved. The library databases on the EBSCOhost platform include Academic Search Premier, Alternative Press Index, America: History & Life, ATLA Religion Database, Business Source Complete, Catholic Periodical and Literature Index, CINAHL, Communication & Mass Media Complete, eBooks on EBSCOhost, ERIC, GreenFILE, Historical Abstracts, Mental Measurements Yearbook with Test in Print, MLA International Bibliography, Philosopher’s Index, PsycARTICLES, PsycCRITIQUES, PsycINFO, Regional Business News, SPORTDiscus, Communication Abstracts, EconLit, European Views of the Americas: 1493 to 1750, Library Literature and Information Science, Library, Information Science & Technology Abstracts, and Newspaper Source. The Santo Collection includes nearly 900 items and is housed at the Dayton Memorial Library. Father Thomas J. Steele, who retired as a Regis College faculty member in 1997, assembled the collection from the mid-1960s until his death in 2010, and the collection continues to grow. A selection of santos from the collection is on display in the library’s third floor gallery whenever the library is open. Individual objects in the collection are cataloged in the Regis University Digital Repository with extensive information and images. The Thomas J. Steele, S.J. Santo Gallery dedication and opening reception is on Thursday, October 24, 2013. DML 3rd floor gallery, 4:30 – 5:00 p.m.
DML 2nd floor Fireplace Lounge, 5:00 – 7:00 p.m.
Sites such as ERIC, Census.gov, and American Factfinder and their services have been restored. PsychiatryOnline includes access to the Diagnostic and Statistical Manual of Mental Disorders – 5th Edition (DSM-5) and The American Journal of Psychiatry. A number of psychiatry textbooks are also included, as well as the journals Psychiatric Services, Academic Psychiatry (through 12/2013), Journal of Neuropsychiatry and Clinical Neurosciences, and Psychiatric News. The Topics feature allows you to stay up to date with current topics in psychiatry. Each topic links to related articles and book chapters available through PsychiatryOnline. Registering for a personal account enables you to email links to articles, get citations, save tables and figures, and sign up for alerts. They are currently in the process of upgrading the website and certain features, such as emailing book chapters, have been disabled. Safari Books Online is a collection of Information Technology and Business ebooks. Regis Library’s custom subscription to Safari Books includes over 8,000 titles published by O’Reilly, Project Management Institute, Adobe, Microsoft, Oracle, and more. Use of individual titles is limited to two concurrent users. Please log out when you are finished with your session. You can browse by category or publisher. You can also use the Quick Search feature to search by title or search the entire site. Pages may be printed or emailed one at a time. There is no function within the Safari system that will enable subscribers to print all content from a book. Most Safari ebooks may not be downloaded. Want to know more? See the library’s ebook collections guide; many training materials are also available online. Check out Safari Books Online! Some government websites, such as PubMed, are being maintained with minimal staffing during the government shut down. Others are shut down due to the lapse in government funding. The Internet Archive’s Wayback Machine has archived captures for many sites, including the Federal Trade Commission, Library of Congress, and the Bureau of the Census. Clicking the logos in their recent blog post will connect you to a Wayback Machine archived capture of the site. The Dayton Memorial Library will have extended hours October 6th – 9th for midterms. 12:30 p.m. – 2:00 a.m.
7:30 a.m. – 2:00 a.m. Regular hours resume Thursday, October 10th. Due to the lapse in government funding and the partial shutdown of the Federal Government, the systems that host most government websites have been shut down. This includes sites such as USA Trade Online, ERIC, Census.gov, and American Factfinder. Services will be restored as soon as a continuing resolution to provide funding has been enacted. You are currently browsing the Regis University Library news blog archives for October, 2013.